Printed 30% scale at 0.3 mm layers in Sunlu PETG. 30 mm/sec, 245 nozzle, 100 degree bed, 20% infill with supports in CURA 4. 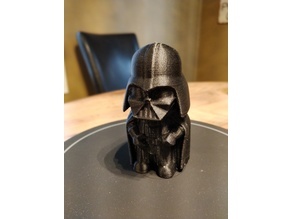 Printed on a Creality Ender 3 Pro with a creality glass print bed. As a side note, this is only my 4th print so I'm very happy how it turned out. The automatic supports from Cura were a little troublesome in areas. Thanks to the original poster. I reminded me of Stewie Vader.